This morning, join us on an excursion for both packages: Guided tour of Brussels and tasting of chocolate. Afternoon spent cruising to Antwerp, reaching it in the evening. 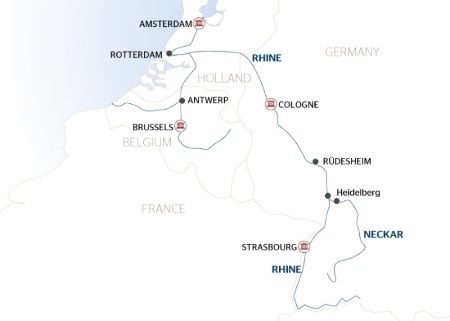 We'll spend the whole day cruising towards Rotterdam, sailing up the Scheldt River, crossing the border between Belgium and the Netherlands, and travelling though the Volkerak and Kreekak locks. Enjoy an evening of entertainment. Morning spent cruising to Utrecht. The afternoon, join us on an excursion for both packages: Visit of The Hague and its inner courtyards. Return on board in Amsterdam. In the evening, join us on an excursion for both packages: Canal boat tour of enchanting Amsterdam at night. Discover the channels that reflect the history of this unique city. CLASSIC: Guided tour of Amsterdam and visit to a diamond merchant's. This afternoon, take part in our excursion for both packages: Volendam and Zaanse Schans. We'll return to Amsterdam by coach. Tonight's our gala dinner and evening. Enjoy free time in Amsterdam this morning, or take part in our optional excursions (not included in the packages): bike tour of Amsterdam or panoramic tour of the city and visit to a diamond merchant's. The rest of the day is free for you to stroll through Amsterdam on your own. We'll sail towards Nijmegen through the night. CLASSIC: Visit to the Kröller Müller museum (2). DISCOVERY: Enjoy a great bike ride through the De Hoge Veluwe National Park (2). The morning will be spent cruising to Cologne. Take advantage of some free time this afternoon or join our hostess for a tour of the old sections of Cologne. We'll then sail on to Koenigswinter. The evening is free to do as you please. Our ship will cruise to Rüdesheim this morning. This afternoon, enjoy some free time in Rüdesheim or join us on an excursion for both packages: Depart by tourist train and stop at a wine tasting cellar*, followed by a visit to the Museum of Mechanical Musical Instruments. Tonight, feel free to amble down the Drosselgasse, famous for its numerous bands and cafes. We'll cruise to Mannheim this morning. In the afternoon, join us on an excursion for both packages: Visit of Heidelberg. Tonight is our gala dinner and evening. We'll sail to Strasbourg through the night. (1) Depending on available mooring, the stopover at Krefeld can be replaced with a stopover at Duisburg. (2) Except on Mondays: optional visit of the Dutch open-air museum in Arnhem.